In the small village Kornic is this beautiful and tastefully decorated holiday home. From the large roof terrace, where there is also the swimming pool is, you have a panoramic view of Punat and on the island Kosljun. The pool is, if the weather and the like runs well, from 15. 04. to 15. 10. You with heated water available. Pool heating 24 hours, you pay Eur 10, - per day, as needed. Relax in this little oasis. The house has on the first floor with a terrace and behind the house a lot. You are also an indispensable barbecue. Learn the rich know historical heritage of the island, and enjoy your active holiday with wakeboarding in Punat or on the karting track in Krk. Experience the beautiful beaches, visit Vrbnik, the island Kosljun, and enjoy the rich cuisine. Relax in this small oasis with outdoor hot tub and a Finnish sauna, and any timely sea. 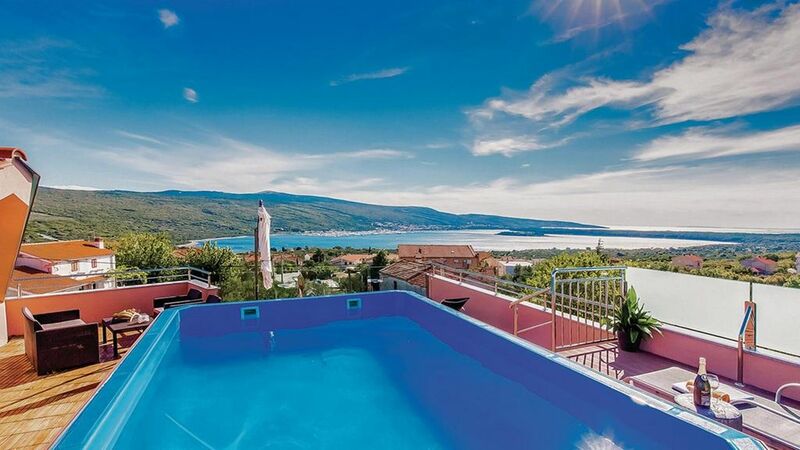 The Villa has a heated roofpool with an wonderfull view to Punat bay and the small Island Kosljun. After a swim you can relax in Sauna or a Whirpool, which is situated on the same Floor aswell..
Me and my friends stayed in this modern villa in October and it was fabulous. It has a sauna, gym, jacuzzi and a heated rooftop pool with a magnificent sea view and we just couldn't get enough of it. A very good thing about this villa is definitely the privacy you get, because you have the whole house to yourself. We are definitely going there again next year! Villa magnifique et équipement au top. Identique très pour très au descriptif. Le propriétaire Izidor et son épouse sont sympathiques et serviables et nous les remercions encore pour leurs excellents accueils. Wir waren mit 6 Personen ( 3 Paare ) in der Villa. Die Ausstattung des Hauses ist toll. Alles sauber und gepflegt. Großes Wohn/Esszimmer mit moderner Küche, Grillplatz hinter dem Haus, große Terrasse mit Sonnenschirm. Eine Garage bietet Platz für 2 Autos. Mehrere Stellplätze im Freien sind ebenfalls vorhanden. Der Dachpool mit dem tollen Ausblick zum Meer, bis nach Punat und der Jacuzzi sind ein absolutes Highlight. Das Haus liegt sehr zentral in Kornic. Zu Fuß im Umkreis von 200 Metern gibt es einen Bäcker einen kleinen Supermarkt ,daneben ein Bistro und ein Restaurant. Das Meer mit mehreren Strandbars ist in ca. 10 -15 Minuten zu Fuß erreichbar. Izidor ist sehr nett und super hilfsbereit wenn es beispielsweise um Reservierungen für Restaurants, Ausflügen, oder Motorroller und Infos zur Insel Krk geht. Wir können die Villa nur weiterempfehlen. Die Ferienwohnung hielt was die Bilder versprachen. Es war sehr gut ausgestattet, sauber und man konnte sich gut wohlfühlen. Der Dachpool mit 30 Grad und Blick übers Meer war super. Im Whirlpool konnte man sich zusätzlich wunderbar entspannen! Wir waren mit 4 Erwachsenen, 1 Jugendlichen und 3 Kleinkindern dort. Direkt in der Nähe war ein Supermarkt, ein Bäcker, eine Kneipe und ein gutes Restaurant. Wobei wir vom Restaurant das Essen liefern liesen, da es mit den Kiddies einfacher war. Im Umkreis waren auch viele Sachen die man ansehen konnte, Strände die man besuchen kann und so weiter. Unser Vermieter war total super. Er kümmerte sich jeder Zeit um uns, half uns mit Rat und Tat. Wir können diese Ferienwohnung, den Vermieter und den Ort an sich absolut empfehlen. Vielen Dank! Die Villa ist in jeglicher Hinsicht atemberaubend. Die Bilder treffen einhundert prozentig zu. Der Ausblick ist wunderschön. Der Whirlpool ist beheizt und top. Der Pool ist ebenfalls beheizt. Alles ist super sauber und übertraf vollkommen unseren Erwartungen. Wie würden die Villa jederzeit wieder Buchen. In the small village Kornic is this beautiful and tastefully decorated holiday home. From the large roof terrace, where there is also the swimming pool is, you have a panoramic view of Punat and on the island Kosljun. Relax in this little oasis. The house has on the first floor with a terrace and behind the house a lot. You are also an indispensable barbecue. Learn the rich know historical heritage of the island, and enjoy your active holiday with wakeboarding in Punat or on the karting track in Krk. Experience the beautiful beaches, visit Vrbnik, the island Kosljun, and enjoy the rich cuisine. Relax in this small oasis with outdoor hot tub and a Finnish sauna.